The White Sox announced Thursday morning that they’ve placed right-hander Lucas Giolito on the 10-day injured list due to a strained left hamstring. To replace Giolito and outfielder Daniel Palka, who was optioned to Triple-A following last night’s game, they’ve recalled righty Carson Fulmer and outfielder Ryan Cordell. Giolito tells reporters that he expects to only miss a pair of starts with the injury (Twitter link via Daryl Van Schouwen of the Sun Times), but it’s still a discouraging setback for the former top prospect. The 24-year-old had an awful first full season in 2018, stumbling to a 6.13 ERA in 173 1/3 innings, but he’s shown some encouraging signs early in 2019. His fastball velocity is up nearly a mile per hour over his 2018 average, while his swinging-strike rate is up from a pedestrian 8.3 percent to a well-above-average 12.4 percent. After averaging just 6.5 K/9 in 2018, Giolito has already punched out 23 hitters in 18 2/3 frames. He still needs to improve his control, but the early improvements in velocity and missed bats are encouraging even if his ERA is still at an elevated 5.30 mark. The White Sox announced today that they have selected the contract of veteran righty Ervin Santana. He’ll make his first start for the club today after inking a minor-league deal this spring. The groundwork for Santana’s ascension to the MLB roster had already been laid by the Chicago front office. There was already a 40-man roster spot to work with and the team optioned righty Carson Fulmer back to Triple-A yesterday. It’ll be interesting to see what the 36-year-old Santana has left in the tank. He was sidelined for much of 2018 with a lingering finger injury and wasn’t effective when he was able to pitch. But he was stellar in the prior two seasons, turning in a 3.32 ERA over 392 2/3 total innings. The peripherals didn’t support quite those results, and expectations ought to be tempered, but there’s reason to hope he can return to being a solid MLB starter. As for Fulmer, he’ll need to earn his way back into the majors or await an opening. He has now seen action in parts of four MLB seasons but hasn’t come close to fully harnessing the talent that led the South Siders to pick him eighth overall in the 2015 draft. Through 70 1/3 innings at the game’s highest level, Fulmer owns a 6.53 ERA with 7.8 K/9 and 5.9 BB/9. Right-hander Ervin Santana will make his White Sox debut Tuesday with a start against the Rays, James Fegan of The Athletic and Scott Merkin of MLB.com suggest. Santana is not on Chicago’s 40-man roster, but the club has an opening, so a corresponding move isn’t a necessity in that regard. The White Sox did free up a 25-man spot Sunday when they optioned outfielder Ryan Cordell to Triple-A Charlotte, though. Once promoted, the 36-year-old Santana will immediately become the elder statesman in a White Sox rotation which features Ivan Nova, 32, and three mid-20s hurlers in Carlos Rodon (26), Reynaldo Lopez (25) and Lucas Giolito (24). The former Angel, Royal, Brave and Twin will bring a quality track record to Chicago, having logged a 4.06 ERA/4.26 FIP in 384 appearances (381 starts) and just over 2,400 innings. Santana has also fired upward of 200 frames in six individual seasons, including as recently as 2017, when he turned in a terrific 3.28 ERA in a 211 1/3-inning campaign in Minnesota. Had that version of Santana shown up last season, he likely would have landed a guaranteed major league contract in free agency over the winter – or the Twins could have exercised his $14MM option for 2019. Instead, Santana suffered through what may have been a career-worst campaign and then sat on the free-agent market for nearly four months before signing a minor league contract with the White Sox in late February. However, the deal did come with a $4.3MM salary in the majors, which is especially high for a minors pact. A right hand injury limited Santana to just five starts and 24 2/3 innings in 2018, when he registered an atrocious 8.03 ERA/7.94 FIP with a personal-worst strikeout rate (5.84, compared to a lifetime 7.18) against 3.28 BB/9 (versus a career 2.8 mark). Nevertheless, after their rotation was among the majors’ worst last season, the White Sox deemed Santana worthy of an affordable, low-risk accord. Now, a rebound from Santana would be a boon for the White Sox, who have received mixed results from their starters this year. Rodon has been effective in both of his performances, while Nova and Giolito have each posted one solid start and one clunker, and Lopez hasn’t been good in either of his appearances. The White Sox have officially announced that outfielder Eloy Jimenez will open the season on the active MLB roster. Outfielder Jon Jay and righty Ian Hamilton have been placed on the injured list, with outfielder Ryan Cordell joining Jimenez in the majors. Jimenez, the organization’s top prospect, had previously been optioned down but went on to sign a precedent-setting extension. That no doubt played a significant role in today’s decision, but the ensuing loss of Jay to a hip strain also cleared a path. The hope will be that Jimenez emerges as a star from the outset of his MLB career. But with the club now controlling him for eight full seasons, thereby obviating any service-time considerations, it can make its future roster decisions with reference only to team need and Jimenez’s development. The White Sox announced Friday that they have released outfielder Brandon Guyer. He’d been in camp on a minor league contract. The 33-year-old went 5-for-23 with a homer and a pair of walks (against eight strikeouts) in his brief time with the club this spring. Guyer struggled in 2017-18 with the Indians, hitting at a .220/.312/.351 clip with nine homers in 413 plate appearances. He batted a combined .266/.356/.403 between Tampa Bay and Cleveland from 2014-16, however, and he’s generally been a solid platoon bat over the life of his MLB tenure. In 792 career plate appearances against lefties, Guyer has a .274/.376/.449 batting line. He’s more of an on-base threat than a power threat, in part because of the astonishing rate at which he’s hit by pitches. 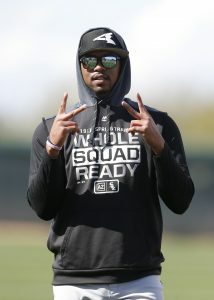 Chicago has one corner-outfield slot earmarked for Eloy Jimenez, while playing time elsewhere in the outfield will be divided up between Jon Jay, Adam Engel, Leury Garcia and Daniel Palka. Guyer will have the opportunity to search for a bench role with another club — the Braves are reportedly considering alternatives to Adam Duvall — though the fact that he has just 356 career innings in center field don’t help his cause. White Sox pitching prospect Dane Dunning has undergone Tommy John surgery, the club announced to reporters including Daryl Van Schouwen of the Chicago Sun-Times (via Twitter). He’ll miss the entire 2019 season and, in all likelihood, some of the 2020 campaign as well. This news isn’t surprising given the course of recent events. The club had acknowledged that replacement of Dunning’s ulnar collateral ligament was a possibility. Dunning was generally considered one of the game’s hundred or so best overall prospects, even after his otherwise excellent 2018 campaign ended with elbow issues. Before that development, which ultimately proved a precursor to today’s procedure, Dunning had spun 86 1/3 innings of 2.71 ERA ball at the High-A and Double-A levels. He recorded 10.4 K/9 and 2.7 BB/9 in that stretch while drawing grounders on more than half the balls put in play against him.